Patrick Russell and James Piers Taylor address the sponsorship, production, distribution and key themes of British documentary during this period. They paint a vivid picture of institutions – from public bodies to multinational industries – constantly redefining their relationships with film as a form of enlightened public relations. Patrick Russell and James Piers Taylor address the sponsorship, production, distribution and key themes of British documentary during this period. They paint a vivid picture of institutions – from public bodies to multinational industries – constantly redefining their relationships with film as a form of enlightened public relations. ﻿Britain emerged from war a changed country, facing new social, industrial and cultural challenges. Its documentary film tradition – established in the 1930s and 1940s around legendary figures such as Grierson, Rotha and Jennings – continued evolving, utilising technical advances, displaying robust aesthetic concerns, and benefiting from the entry into the industry of wealthy commercial sponsors. Thousands of films were seen by millions worldwide. Received wisdom has been that British documentary went into swift decline after the war, resurrected only by Free Cinema and the arrival of television documentary. Shadows of Progress demolishes these simplistic assumptions, presenting instead a complex and nuanced picture of the sponsored documentary in flux. 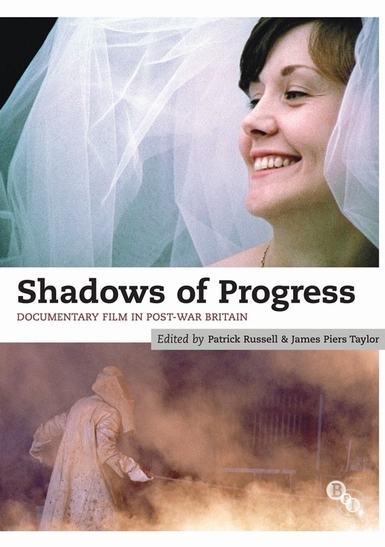 Patrick Russell and James Piers Taylor explore the reasons for the period's critical neglect, and address the sponsorship, production, distribution and key themes of British documentary. They paint a vivid picture of institutions – from public bodies to multinational industries – constantly redefining their relationships with film as a form of enlightened public relations. Many of the issues that these films addressed could not be more topical today: the rise of environmentalism; the balance of state and industry, individual and community; a nation and a world travelling from bust to boom and back again. In the second part of the book, contributors from the curatorial and academic world provide career biographies of key film-makers of the period. From Lindsay Anderson's lesser-known early career to neglected film-makers like John Krish, Sarah Erulkar, Eric Marquis and Derrick Knight, a kaleidoscopic picture is built up of the myriad relationships of artist and sponsor. ﻿Britain emerged from war a changed country, facing new social, industrial and cultural challenges. Its documentary film tradition – established in the 1930s and 1940s around legendary figures such as Grierson, Rotha and Jennings – continued evolving, utilising technical advances, displaying robust aesthetic concerns, and benefiting from the entry into the industry of wealthy commercial sponsors. Thousands of films were seen by millions worldwide. Received wisdom has been that British documentary went into swift decline after the war, resurrected only by Free Cinema and the arrival of television documentary. Shadows of Progress demolishes these simplistic assumptions, presenting instead a complex and nuanced picture of the sponsored documentary in flux. Patrick Russell and James Piers Taylor explore the reasons for the period's critical neglect, and address the sponsorship, production, distribution and key themes of British documentary. They paint a vivid picture of institutions – from public bodies to multinational industries – constantly redefining their relationships with film as a form of enlightened public relations. Many of the issues that these films addressed could not be more topical today: the rise of environmentalism; the balance of state and industry, individual and community; a nation and a world travelling from bust to boom and back again. In the second part of the book, contributors from the curatorial and academic world provide career biographies of key film-makers of the period. From Lindsay Anderson's lesser-known early career to neglected film-makers like John Krish, Sarah Erulkar, Eric Marquis and Derrick Knight, a kaleidoscopic picture is built up of the myriad relationships of artist and sponsor.